Very Important ACRONYMS & TERMS of Semicondutor Industry. 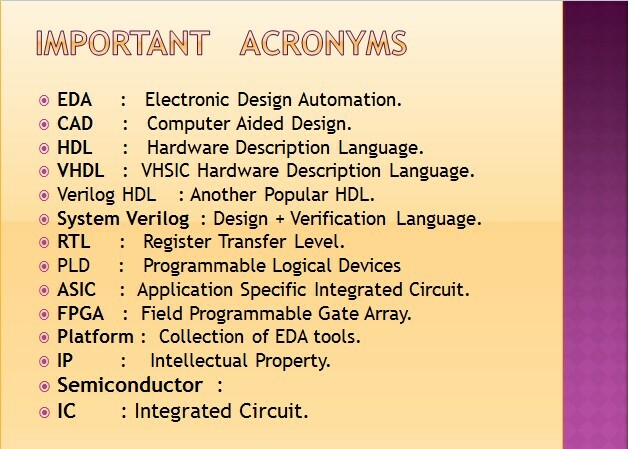 Important Acronyms & Terms of Semiconductor Industry (Learn VHDL with Naresh Singh Dobal). So Friends my first question to you is, that what we are, in this electronic semiconductor industry, We are EDA, i.e Electronic Design Automation, As the name indicates that we automating the design of electronics, That means we use computers to design all these complicated chips that may be used in Ipods, Laptops, Display systems, Sound systems, cell-phones, Tablets, Industry automation system, security system, medical etc. The next important thing is CAD that is Computer Aided Design, in the past few deades we are using CAD Tools in every field like mechanical design, civil design, automobile design, IC design, system design etc. This is the very important thing in EDA industry that is HDL called Hardware Description Language. This is actually a computer Language, This is very important in VLSI Industry, using HDL we tell the computer to help in design of any integrated circuit, HDL's are working on the same manner that other programming language works that you give some commands to the computer, like computer do this, computer do that .. in this manner. There are many HDL's in market, Here I am telling you about the most popular HDL i.e VHDL. VHDL, stands for Very High Speed Integrated Circuit Hardware Description Language. Another popular language is Verilog & System Verilog. So as all other competitive languages there is a language war, that some says VHDL is better, some says no Verilog is good, and some says System Verilog is good. But this is not in that manner, all the language do the same thing but in different manner, It's just like same, some says English is good, some says hindi is good. So people can choose that which they want to use. This may be choose by designer, or by a company or Country wise as well. The next important term is RTL, RTL stands for Register Transfer Level, This is very common term used in EDA industry, This is basically a collection of subsets or collection or commands or the blocks of electronic components having some type of combination or sequential circuit or the basic logical gates. PLD's are Programmable Logical Devices, as name suggests, that the devices which can Program a Logic inside it are named as PLD's. There are many type of PLD's in market like PLA (Programmable Logic Array), PAL (Programmable Array Logic), PROM (Programmable ROM), SPLD (Simple PLD), CPLD (Complex PLD), FPGA (Field Programmable Gate Array), ASIC (Application Specific Integrated Circuit). ASIC stands for Application Specific Integrated Circuit. First we take a example of general purpose chips like a intel processor, I put that chip in a microwave oven and I say cook my food, and then i places that chip into a traffic light and I say "change the signals according to traffic density", then I put that chip into a security system and say when some one enter in my room then play some sound, Or i place it into a mobile and say ring when someone is calling me, So this a a example of general purpose chips, but if i want a chip that only performs a one very tiny tiny specific function that no other chip can do.So that chip is very much specific to my own application, so lets say I want to make a chip which only tell me when some one walks in my home, that can be specific function, so ASIC are the specific type of chips. FPGA : FPGA stands for Field Programmable Gate Array. This is a special type of chip, which can be use for general application, and the more things about FPGA's We will discuss later. When we work on that chips. Platform : Platform is basically a foundation where some thing can be stand, but if we talk about VLSI industry then platform means the collection of EDA tools. IP : This is a very important term in EDA industry, that may confuse to you with the IP i.e. Internet Protocol, but we nothing to do from that IP in our industry. In our industry IP stands for intellectual property, and there is mainly two expect of intellectual property. So what is Intellectual Property, these are our ideas or inventions or creations which are generated in our head and the reason of intellectual property is so important because if some one steal your ideas and do's that same things, and often gets money it's not related to there business but it's hurts, and This is really a bad thing. So our industry plans of IP. Using these IP we protect the intellectual properties with legal agreements, so intellectual properties is very very important, the second things about the intellectual property is also mean design, chip design and if I come with this brilliant idea of design but I want to protect that and I also want to reuse that so I can build bigger things at top level, so IP's are the building blocks in a comlex chip designs. And we can use that in the top level designs. Fact is There are thousands of employees works in a industry, but the major thing is ideas, mind, creations, logical thinking, designing abilities. Semiconductor : Semiconductor, I am explaining this term in very simple way, semi means partial, conductor means conducting of electricity so what is semiconductor means that some other time this conduct the current threw it or some other times this blocks the electricity. IC : IC are integrated circuits or integrated chips.